Elizabeth Gilbert says this to a friend when explaining why she feels compelled to drop everything and travel to Italy, India and Indonesia in the name of finding herself. She’s lost so much of who she used to be during her divorce, she says, and in the unhealthy relationship that quickly followed, that she thinks a strong dose of splendor, both literal and figurative, will help pull her out of the existential mire she finds herself in. What effect do you find the act of marveling at something has on you? What is the most beautiful thing you’ve ever seen, or the most profound moment you’ve ever experienced? How did it change you? I think pregnancy is a marvel. Women are the most beautiful when they are glowing from pregnancy, it is so wonderful to watch. I loved being pregnant, I felt beautiful, I felt powerful, and to have a human being growing inside of you it is just amazing. How did it change me? It changed me into a mother, something I wasn’t before, it made me into who I am today. I miss my son during his teenage years, he doesn’t need me as much now, but he knows that I will always be for him. since moving to my house in the country, i have noticed nature…..the stars, crickets, deer, squirrels, birds…….nature is so beautiful we sometimes take it for granted. To marvel at something reminds you of how very connected we all are. It is an amazing feeling that at times overwhelms me. It is wonderous to me, how I can just be going about my day when I suddenly see something that I may not see everyday. I love my life and I am always thankful for the blessings God has given me, but sometimes I see a vagrant crossing the street, high on who-knows-what and there are times when it can bring me to tears. It can be easy to think, “Why doesn’t that bum just get a job?” But, you really have to wonder how bad must his/her circumstances be in order that they would continue to go on living like that. Do they have a choice? Has anyone ever reached out to them? I marvel at the fact that every day there is always the possibility that ordinary people have the chance to make a profound difference in somebody else’s life, even with the smallest gesture. As for the most beautiful thing I have seen on this earth: I still remember opening my eyes, exhausted from labour, to see my newborn daughter looking right into my eyes. Gorgeous. It’s been 10 years, but just typing this makes me well up! I love her. I have traveled to many amazing places in the world with such spectacular sights. But I try to marvel at our world every day. I make sure that at least once a day I just stop and breathe, look around at the blue sky or the swaying trees, and be happy that I am alive. Life is good, in spite of the hectic hussle and bussle. Take a moment to slow down. Drink your life in. My favourite times are when I’m camping, or out at the cottage, away from all the lights and sounds of the city. You can look up to the sky, and it seems like it goes on forever, and the stars are so much brighter, and to just listen, and hear what nature has to say. It’s a very grounding experience, to realize how big the universe is, in comparison to how insignificant I am, and how many other creatures are in the world, making it go round. In the spirit of travel I think one of the most moving things to happen to me years ago occurred in a slate mine in Wales. What you say? We visited a slate mine because my husband loved going underground for some reason. area we pressed the button and a Welsh male choir of a hundred voices filled the acoustically perfect area. I cried, my husband cried and we have been talking of this experience for many years. I still cry when I remember how moved I was. I thought I fully understood what Elizabeth Gilbert meant when she said “I want to go someplace where I can marvel at something.” Life becomes routine, hectic…out of control…it’s when we don’t have time to stop to smell the roses. It wasn’t until my trip to St John’s, Newfoundland this past June when I stood on top of Signal hill…tears streaming down my cheeks as I saw the Atlantic Ocean for the first time. I was able to MARVEL at the extreme beauty of nature and power of nature; the waves crashing against the cliffs, whales breaching in the distance and the salty ocean air blowing across my skin. I honestly can not remember a better moment in my life. I felt found. Complete. Whole. Many areas in Newfoundland will have that affect on you ~ There truely are many quaint, wholesome, awesome places to visit. From the people – genuine! to the ocean and hilly landscapes! A real paradise! 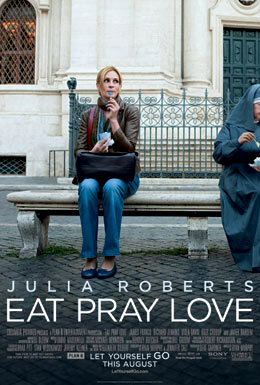 I am soooo looking forward to seeing this movie and Julia Roberts ~ who better to play this role! While recently being rejected, I was heading off on a boat and started to feel even worse, and very sea sick. I prayed to God and asked for signs of hope, and comfort. I asked for healing,and inner peace. I remember thinking I was asking for a lot, but why not? I deserved it. I soon looked up at the skies and saw a large white smile as two clouds crossed. I thought I was dreaming, and quickly grabbed my camera. Too late, the cloudy smile had moved on…My God didn’t disappointed me though, and soon a large rainbow filled the sky and felt as though it touch the waters surrounding the boat. My mind and heart were instantly put into a comforted love of pure grace. I also agree with Jackie. One can find so much beauty and contentment, going camping, up North somewhwere; the vastness of the midnight sky, overwhelming stars, sometimes the Aurora Borealis and the Northern Lights, just tend to make you feel so small, but yet so much closer to God. It’s just so–oo-oo amazing! There can be no other feeling like it, accept for maybe standing atop a high mountain, and feeling as if you could reach out and touch the beautiful blue sky! These have been a couple of my experiences, and so far, nothing has ever surpassed them. For me, my perspective changed after going through a health problem and emerging with a totally new outlook on things around me that previously I took for granted. Like Heather and Kathleen, it’s the moments in nature…wicked storms, listening to waves crash, going for a walk in autumn…it’s simple but so amazing. I think there was one moment in my life: when I first arrived in Florence, Italy. The beauty of the place was overwhelming. The art. The centuries-old buildings and cobblestone streets. The gold jewellery. The gelato. The entire city was a work of art, at once ancient and modern. I will never forget the feeling that hit me like a lightning bolt: that I had found absolute perfection in the world. When I marvel at something it makes me humble. It makes those trivial things that I worry about and have to look after seem small. I realize we are part of such a wonderful world…that we should take more time to marvel and enjoy each and every day!!!! Lately I seem to be living vicariously through my friends and acquaintances, especially the travelling ones. When I was younger I did a fair bit of travelling and just loved it, and still do. But I don’t really get a chance as other priorities are keeping me from it. It takes time, a rare commodity, and money, even rarer at best. So if I can watch a movie that takes me to that place I cannot get to, or read some words, or listen to some music, or be told about an adventure, or look at photos, or art, then that to me is the best. actually smell the rose to know what it is it smells like. The act of marveling at something nice like beautiful scenery put me in a common state of mind, and I feel at peace. When my friends and I traveled from Florida to California on a four days road trip, we drove along fresh country road sides, lovely mountains peaks and blue lakes. It really was one of the profound moments I experienced in my life, and I learned to really appreciate the beauty of the world and value friendship too. I have always told my children “Life has many detours, although the route may seem longer it is usually more scenic…relax and enjoy!”. I truely believe this. My own life has given my many hardships (“detours”) but I have learned more valueable lessons from them all and have brought me to a better place in life. The most beautiful thing I have seen is……the look in my my Dad’s eyes and my Mom’s eyes when they were looking at each other. When one walked in the room, no one else existed. They were very happily married for 63 years (before my father’s death four years ago). Both of their eyes would definitely ‘light up’ when they say the other person. It is a memory I will dearly forever. They held hands until the very end. A very lasting, loving and beautifuly relationship. I think the most beautiful thing I’ve ever seen was: a hummingbird. Out of nowhere, he flew in front of me, and stayed (flapping his wings and such a rapid pace that I could barely tell he had wings) right in front of my face. He stayed there, facing me, flying still for a good minute….and then he flew away. For that minute, time stood still as I marvelled at that amazing bird! Totally breathtaking. I had not taken a summer vacation in 2 years, due to family that needed my care. When they no longer required my care, I realized I needed some away time. Although I had neither the time or finances for a trip like our protagonist, I carved out time for a very quick trip, only a short distance from home. It turned out to be a much needed turning point in my life. For the first time in a long time I did not have the needs of others at the top of my priority list. Although I could have stayed in bed a little longer, I eagerly got out of bed to explore the city and rediscover my likes and desires. I wanted to fill each day with something pleasurable. I found a number of things to marvel at, perhaps the most important, that I liked my new found freedom and the simple pleasures of doing something simply because it was enjoyable for me. It was a very inexpensive, simple, short trip, that reminded me, we do not know how long we have here on this earth and that we do not need to go far or for long to find something to marvel at. We must simply stop and take the time. Sometimes a two hour movie or time with an interesting book or good friend is all it takes, but a short trip away refreshes and makes us see the marvels out there, including those in our back yard. I read this book at the same time as a friend, we’d call each other from time to time and talk about “the trip”. We are now looking forward to seeing the movie and going on the trip again. I have to marvel at the outpouring of love one gives to a recently deceased person. The funeral this past weekend of a friend who was a fireman, and who died suddenly at the age of 56 yrs, was the most memorable thing i have seen. The vast numbers of fellow firefighters, known to the victim and unknown, was overwellming to me and must have stunned his family. It made me aware of how we impact on everyone we meet, no matter how brief our encounter has been. The love and admiration shown from my friend’s; other family (his work family) was undoubtably so emotional it moved all present to numerous tears. I can only hope that i have impacted as much on people i have met in my life. What makes me marvel, is witnessing genuine unselfishness in others, this makes me marvel about mankind. I feel like this is the true mankind coming through. The other day, I saw a bird who appeared to be stunned/frozen in place on the ground in a parking spot at the mall. I stood near him to decide what to do, thinking I would try to pick him up and move him to a safer environment while he composed himself. Two passers-by stopped to enquire/help/figure out what would be best for the bird. It was as if everything else stopped, and all that mattered was making sure this little bird was ok and safe. These kind of interactions really touch me. A happy ending – when I went to pick up the bird, he finally moved/fluttered to a nearby tree. He was fine! By these shared marvels, it appears that we really don’t have to travel anywhere to find something to marvel. We have to stop — I mean STOP!! — and breath, and listen, and marvel at all the energy around us. I am so going to enjoy watching Julia marveling in glorious Italy, incredible India and (my dream) Bali. Tomorrow when I go out to an early morning appointment, I am going to find something to marvel at, and then be oh so grateful that I can. Retirement = time to stop and smell the roses. Having the time to help others. Being able to take advantageof a holiday on a moments notice. I had not realized just how much fun was possible in my life. One of the most beautiful places I’ve ever been to is actually India. While traveling in the South, I marveled at how many shades of green I was actually able to see. Between the tea fields, orange sunsets, and exotic animals it was definitely amazing! One of my fondest memories is sailing the backwaters of Kerala surrounded by coconut trees. To put this vision in perspective, imagine Venice but instead of buildings lining the water it feels like you are in a jungle! It’s amazing! You can find beauty in anything. I think it more about being intentional and making a conscious decision to appreciate things we often take for granted. I think it is important not to just let things happen to you, but to make choices that guide your life to where you want it to go. The beauty of it all is knowing you have the power to make the choice. I think that is what Elizabeth Gilbert’s messsage is. You don’t have to travel the world to “marvel” … you can find the “awe” in many awesome things that surround you in your everyday life if you take the time to look … like a rainbow in the sky at the end of dark storm … or a humingbird gathering nectar from a flower … the peace you feel by sitting beside a reflecting pond … a glass of cool, refreshing water after a long, hot day at the beach … the tinkle of windchimes, kissed by the wind just before you fall asleep … it’s all there … you can experience every one of your five senses many times a day … if you take the time to “smell the roses”. Excellent book. Made me want to take a year off and travel to all the places I’ve always wanted to go, but never had the time (off work) or financial freedom to accomplish as the author did. Just work away at your “Bucket List” because time may be short! I use to take motherhood for granted, not being a mother two years ago I wouldn’t understand why a friend or colleague didn’t want to leave their child with a babysitter or look forward to some time out with friends as oppsoe to playing with toys all day…I didn’t get it, I always thought that once I became a mother, I knew I would take care of my child the best way that I could, but that I would still try to maintain somewhat of the same lifestyle. I became a mother 13 1/2 months ago to a beautiful and healthy girl, she is my everything, she has changed my life in so many ways it’s hard to describe, in ways that I am very grateful, I couldn’t imagine my life without her, she completes me in so many ways. I completely “get it” now, I see why my friends didn’t want to go out on a Friday night or have their child babysat, they wanted to spend quality time with their child – every chance I get I want to be with my daughter, I want to watch her grow, watch her become her own person, laugh with her, play with her and learn with her. She is the most beutiful thing in this world to me, she makes me stop and enjoy the simpler things in life and to leave my worries behind, she helps me take life at a slower pace. Becoming a mother has been one of the most profound moments in my life and I wouldn’t change any part of it. Picture if you will, a steep hill. You are at the top looking down. As you start to move down this hill, your hands release from the bars, and you allow your body to feel your way down the hill. Your arms stretch out; your head tilts back; the wind blowing through your hair and the sun on your face. Your faith in who you are is the only thing guiding you down this hill. As you go faster and faster, you open your eyes, only slightly to see from side to side, the trees as they pass by. You breathe slowly in and out as you become more and more calm and comfortable in your surroundings. Knowing that when you get to the bottom of that hill, you will arrive a better person. More aware; cleared mind and soul. You take in all you can, the smells, the sounds, the warmth from the sun, and the cool from the wind. Every sense heightening as you go. You can now taste the smells in the air. You can see the light through closed eyed. You are at peace. At one with your surroundings. It all makes sense. I marvel at that hill…the calm, the beauty, and the peace I recieve by taking it all in. BTW, your riding a bike down this hill…lol…just had to make that clear. The most profound moment I’ve ever experienced happened when I was 16. I was spending 6 months going to school in Germany on an exchange and it was the first time I’d ever been away from home for an extended period of time. I felt isolated because I was away from my friends and family and I didn’t speak the language very well. One day after school I was feeling homesick so I decided to wander a bit. I ended up at an old church that was being restored but was still operational so I went inside to look around just as a choir of nuns began practicing some hymns. I sat and listened and afterwards, a few of them came up to me to chat. In broken english (them) and broken german (me) we were able to have a conversation about my trip and about the history of the church. As they showed me a bullet hole in the side of the church that had been there since World War II and urged me to stick my finger in, I remember feeling profoundly proud that I’d taken a risk and made this trip all on my own and because of that I was able to experience history in a way that just doesn’t exist in North America. I had proved to myself that I could handle being by myself, a stranger in a strange land, which has proved invaluable to me ever since. Whether it’s going to a movie or travelling across Europe, I’ve never been afraid of being in the company of myself. What cold be more beautiful and profound than that? I have previously watched Ms. Roberts on a documentary while she spent time living with a local tribe in Mongolia. She expressed several thought provoking ideas about simplicity and I look forward to seeing this film and hearing more about her ideas on the topic of eat, pray, and love. While she is known as a movie star, she also is very articulate about the world around her and able to invite others to share her passion for life. There have been a few things that have made me marvel. The first was the birth of both of my sons. The second time giving birth was no less marvelous than the first. An absolute miracle that I could be part of creating something so beautiful! Now, I also marvel at the most simplest of things. The sky, the birds, the trees, flowers. Trying to really ‘see’ everything. I try to hold it in my mind, in case I need it for later. When I went through a difficult time at the beginning of this year, I kept picturing the ocean as I saw it while vacationing in Mexico. That memory helped me make it through. I try to remember how lucky we are to have all of these beautiful things surrounding us. I try to not take it for granted and to marvel at life everyday! The birth of my two daughters is what I marvel at , plus they are truly beautiful in every way. I want to travel the world and see all what others may never have a chance to see. My eye sight is good, unlike my mother’s who is legally blind. We did have a lot of fun growing up, but now it is different, I will tell her what she sees and she is still happy. I never take anything for granted and always appreciate everyday.! I marvel my 2 grand-dogs and cherish everyday. I love smelling the fresh air and enjoying life. I traveled to Australia a few years back. One day I stayed up all night and sat on the edge of a cliff to watch a sunrise on a beautiful day. I felt amazed at how gorgeous and perfect it all looked. I wish I could wake up that early every day to see this beauty. I read this book when it was first published and can’t wait to see the movie. It help inspire me to create the website i rungirlfriend social. Its a community that allows women to meet other women for friendship purposes and support through many of the times discussed in the book. Because this website frees up a lot more of the 9-5 job time, this book directly inspires me to look for more beauty and relaxed way of life and living out my dreams. A bunch of my friends and I were in Arizona, and we decided to go to the Grand Canyon to see the sunrise. It was early, cold and hard to get up, but when the sun started to rise over the canyon it was unbelievable and worth every painful moment it took to be there. I would do it again in a heartbeat. It was so peaceful and truly a wonder of the world. I am blessed to have been able to experience it. I went to Italy a few years ago and really marvelled at a beautiful little town called Capri. The views were amazing and I never wanted to leave. This October I’m actually going to India and I’m sure that I’ll see some of the most amazing places there! The most beautiful thing I ever laid eyes on was my baby. The first time I looked at him I was blown away by his beauty…. The second and third most beautiful things I ever saw were the Rockies in BC AND Lake Louise and Lake Morraine in Alberta. The sounds, the colours, the smells. The most beautiful thing in the whole world is described in the title of the movie : Eat, Pray, Love – and it is love. The look of love in your parents eyes when they are proud of you, the look of love of your husband when he feels so lucky to have you, the look of love of your friends when they are thankful to have you & talk to, the look of love in your puppy’s eyes when he’s happy to see you & wants to cuddle with you. Love is truly the most beautiful thing in life & I am so grateful to have my parents, husband, friend & my puppy to make me feel loved and to give them back by loving them. My children are most beautiful. I love to watch them discover things for the first time – it really is amazing and makes my heart melt. Just the other day, while having to deal with my Dad having had a bleeding stroke, and my Mum diagnosed with short term memory loss, I went outside and was standing on the back deck praying to God to please help me through this trying time. I looked down and was drawn to a particular area of the lawn, there I saw a blade of grass glimmering in the morning dew. Then the most amazing thing happened, this blade of grass started to change colours; from bright red, to orange, then starlight white. I looked away thinking, I must be crazy! I looked back and it was still there, turning colours. At that moment, I felt a calm and a strength I have never felt before. I went back to tend to my responsibilities knowing God was walking with me. I’m glad that you didn’t completely give up and found that little bit of hope inside of you to keep you going. There are times when people are put under more pressure than they can bear, but it’s really up to the person if they want to make the most of it. The most profound moment I ever experienced was the first time I saw the ocean. Growing up landlocked will do that to you. The first time I went to the coast and saw the big blue I was stunned. I was visiting a town called Blue Rocks and just sat by the ocean admiring it’s infinity and finiteness. I can’t explain it. I felt insignificant but in a way that made me feel like I was a part of something bigger and greater. It was a breathtaking and humbling experience. It was a moment I treasure for I encountered the divine in Nature. I went on a trip to Italy because the opportunity appeared right in front of me. Before this, I never thought I would travel to Italy, or travel anywhere at that time. Im proud of myself because I took on a new challenge to travel by myself for the first time, and I discovered that I absolutely love travelling. Unlike most people, I love being on a plane, and being in airports! Traveling to Italy also opened my eyes. I learned how theres so many beautiful and historic things in this world that I have yet discovered. This trip which only lasted a week, helped me enjoy life and realize that putting effort in your own life is the most important thing to do. The first time I went to China, I met my cousin and her husband and that was what I had to marvel at. They were both in their 70’s and at a time when arranged marriages were the norm, these two found and fell in love with each other while attending university. Even at their advanced age, you could feel the love between them. Even more special about that meeting was my cousin’s husband. I felt honoured to have had an opportunity to meet such a person. Everything about him exuded peace and trust. This was a man who had learned total acceptance of everyone and everything in the world. You could say anything to him and know that you would never be judged, only accepted. I was not the only one who felt his magnificent aura. His daughter-in-law told me that in the 10 years, she had been married to their son; she had not heard a single cross word between parents and son. That only can come with total acceptance. If that one idea could be spread throughout the world, there would be total peace. When I was 19 I went to Quebec City. My boyfriend and I got in the car and drove there. I saw the signs changing to French signs when we were close. I had my french and english dictionary and had so much fun. When we got to Quebec City it was absolutely breathtaking. We had so much fun admiring the art shops and eating outside at the cafe’s. It was my favourite place to go. I want to take my kids there now they both know French. I think the most beautiful thing ive ever seen was in the grand cayman. Me and my gfs took a catermeran trip just before the sunset, its a marvelous spectacle. Just as it starts to disappear into the ocean from a cloudless sky, in a flash of light its gone and u just see the radience its still excuding from it. Ive never seen this again. Ive been to alot of beaches but wow what a grande sight to see. So simple but yet so memorable. That following yr i was single. And i had the best yr of being single, traveled once a month at least and enjoyed life. now in a new relationship and experiencing more wonderful trips to talk about! Having my brothers and sister, my mom, husband and grown sons altogether. It doesn’t get any better. The way i feel when were altogether is overwelming. Its my piece of heaven. Travelling inspires stopping and looking at everything. It’s funny how being removed from familiar settings makes even the simplest sign amazing. We had a heck of a time at Heart’s, a really neat coffee shop in Portland. It was in a quiet residential area in Portland, and I had my first ever syphoned coffee.